DVD Review: "The Color of Noise"
A lengthy and, at times, wildly entertaining look at the (long time) Minneapolis-based label/arbiters of “noise core” or whatever you care to call it. 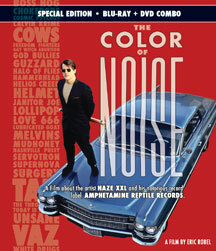 The Color Of Noise chronicles – at detailed length, which gives great insight into Amphetamine Reptile’s story – the foundation and rise to this label and its founder, ex-U.S. Marine, Tom Hazelmyer. Done with a great deal of humor, the label, Hazelmyer and the history unfolds an important link to the mid-’80’s rise of “American Underground” and what was to follow throughout the early ’90’s. By establishing AmRep as an outlet for his own outfit, Halo Of Flies (which had been turned down by several labels), it opened the door to many other groups who would gain a great deal of traction: The Melvins, Helmet, Helios Creed, The Cows and so on. Aside from a musical forum, AmRep also helped shape its own sense of style with the graphics and designers employed to do the album covers and poster art, none more famous than Frank Kozik. Aside from the necessary factual details, you get a glimpse into the ethos of the label’s culture; a freewheeling, dark humored and motley crew of management and musicians. Much of it is drug and alcohol fueled and the losses of several musicians cannot be discounted (most known, Kristen Pfaff of Janitor Joe, who went on to play bass for Hole and pass away from a heroin overdose). And much of it borderlines on jock/frat-boy humor, except not as egregious. Still, not your average indie-record-label-makes-good story. Admittedly, while much of the music itself is too abrasive for my tastes, the label clearly had a defined “sound” (if you will) and direction, which helped propel it to its heights of popularity/cult status. And kudos to them for having done so. At a time when labels cropped up, rose and then either imploded or were swallowed up in the Pac-man-ing of indies by the majors, AmRep stayed the course. Check this documentary out – in many ways, they actually show you how to get a label going, moving, thriving and done kinda right.